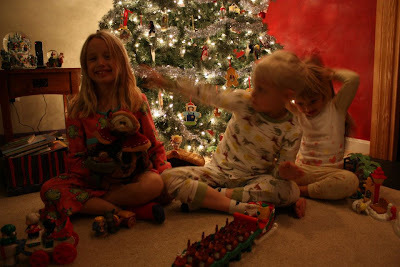 The past 2 years, I've gotten the most beautiful, happy, sweet photos of my kids for Christmas card photos. I know that the reason they turned out so well was because they happened randomly and organically. They were in good moods, I wasn't actually trying to get a photo - it just happened. Fast forward to this year and you have the photo above. I sat the kids down for the sole purpose of getting a Christmas card photo. BIG mistake. Huge. I took like 50 photos in the span of about 7 minutes and they were all borderline disaster. My lighting was kind of bad and I really could have done a better job with that (and photoshopping would have helped had I gotten a good shot), but that said, my subjects were worse. Caroline was actually trying though, so I give her credit. She's the one that truly wants to take a photo for our cards. She's starting to understand that we get cards/photos from others and wants to return the greeting. Bryce and Piper, on the other hand, have no concept. Piper wouldn't stop moving or doing weird things like throwing a Santa back and forth over her head. And then there's Bryce. Ah, Bryce. He's a typical 6 year old boy, I believe. When he would "smile" it was a harsh, ugly grinned aimed at basically telling me that he wasn't going to smile nicely no matter what I did. Bug off, mom!! And then he started messing with his sisters which made it even worse. I kept snapping hoping that maybe, just maybe a good one would result. So here we are with a little over a week until Christmas and I've got nothing. Jason said I could just do individual photos from earlier in the year but that's just not my style. I want a new photo. NEW! The kids change so much that a photo from summer isn't recent enough for my personal taste. I have said aloud a few times that I guess we just aren't doing a Christmas card this year and Caroline gets kind of upset. Last night I came up with a fun/silly idea for a photo that maybe even Bryce would be interested in but when I proposed it to Bryce this morning it was met with a look that said "You're so lame, mom." Then he said he would just sit off to the side and I could take photos of the girls. I told him I would take his photo, color it green and say he's the Grinch. I can tell he get some joy and pleasure of throwing a wet blanket on my ideas these days. Maybe something will magically happen at Christmas and I'll send out a New Year's card. But I'm not banking on it.